If good things come in small packages, then the R7 is a really good thing! Compact in size but not in performance, the Beeman R7 is often called the "little R1." It's that good. Other than size, there are very few differences between the R1 powerhouse and the R7. Through the double-jointed cocking lever, the R7 delivers a reduced cocking effort (almost half the R1). That makes this the perfect gun for smaller shooters, women or anyone who wants an easy-cocking spring-piston gun. It's 5" shorter than the R1 & 2.5 lbs. lighter. Don't worry about marring the finish, because the satin finish on the stained beech stock resists minor scratches. You can get even more out of the gun if you mount a scope. With 11mm dovetail grooves in the receiver, scoping the R7 is easy. The checkered pistol grip gives you a solid hold, while the rubber buttpad adds even more control. Like the R1, this gun has the famous Rekord trigger, giving you a predictable, crisp, adjustable let-off. The R7 is a German-made engineering marvel that will deliver decades of shooting pleasure. Don't forget to pick up a variety of recommended pellets, which are listed in the AMMO link. Select appropriate accessories, including scopes and targets, by clicking on the ACCESSORIES link. Things I liked: Accuracy. Light weight. Easy cocking. Nice finish: no nick, no chip, no discoloring. Better finish than all $190 - $450 German RWS I have. Kind of expensive for a little air rifle but it is as good as every other owner said. Things I would have changed: The scope grooves are really sallow. Deeper grooves would be more desirable. What others should know: The price for this rifle is going up pretty fast. It has been up over 20% since I bought it a month ago. Grab it if you find a good price. Some think it is under power, but that is exactly what a air rifle for targeting should be. Even the most powerful air rifle can not compete with a 22 rimfire, which is considered "toy gun" round among those big-bang firearm shooters. Things I liked: Light cocking, extremely pleasant trigger (no creep, just some light pull and crisp release), accuracy is very good, too - you can scope it'll get even better. What others should know: Open sights are very good - don't remove them if you want to scope it. Better yet - try to use them, you might like it. Also, don't forget to clean the barrel before shooting. Things I liked: When we picked up our 2 Beeman R7 air rifles, it was a nice pleasurable experience. They treated us very nice assisting in everything we asked them to do for us. We would highly recommend anyone looking for and purchasing an airgun or accessories...Pyramid Air is the place. For the R7 ..they still produce top quality air rifles. Very nice to see checkering on the grip and forend areas now. They are great for all ages...even us over 50 group...Easy cocking effort and light to handle for a no matter what your stature. We cleaned the bore and lubricated our air rifles and started shooting in our backyard a week after we got them...The accuracy just never lets you down and will get even better the more we shoot...about 100 rnds first time shooting and kept them with in a quarter size grouping and this was about 50 ft not 30ft....remember older sets of eyes and offhand shooting with open sights...so we don't think that is to bad. Not sure whether we will put on scope or just a red dot scope. Just very happy with the quality. Oh yes, we used the .177 Beeman H&N pellets. Things I would have changed: I would have changed the packaging...Ship air rifle in plastic bag in box. It all was okay...no maring or damage, just think would be better presentation. Not easy getting rifle out of box with out desroying box interior...for people who like ti keep their bixes. 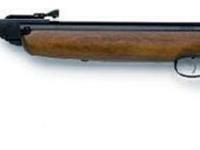 What others should know: The air rifles just balance and handle so great. You feel like you got a qualty rifle for your money spent. Perfectly suited for paper targets, spinners and plinking.